I really hope you didn’t miss this one -- really! But just in case you did, here’s a little snapshot of what transpired on Feb. 9 at Peirce College. 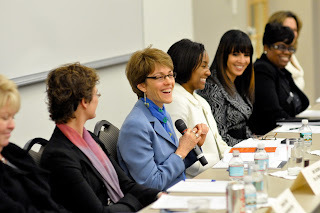 The Career Development Services (CDS) team hosted a “Women in Leadership” panel discussion. Representing various industries, including banking, education, law, government and business, seven women shared their personal and professional journeys with an enthusiastic audience of students, alumni, faculty, and staff. So you may be asking yourself, “why do a panel discussion on women in leadership?” Well, over 70 percent of our student body consists of women. As Patricia Rucker, Chief Academic Officer and Provost, pointed out, these women represent who our female students aspire to be -- if they aren’t already! The women in this session, whether they sat at the panel table or in the seats filling the audience, faced many of the same issues. Mothers, daughters, girlfriends, wives -- they all juggle the pulls of family, friends, and personal needs with the demands of a career. Together, panel participants and audience members alike sat down for a candid conversation that was less about leadership models and more about lessons learned in leadership. This was the “stuff” rarely captured in text books. We talked about everything -- the glass ceiling; taking care of kids while working full time; the stress of balancing multiple responsibilities; the impact of social media on business and job searches (Overwhelming response? Be careful what you put on your social networks! Always be professional and put the best version of yourself out there! ); how to make an impression, or simply be seen, in a world increasingly dictated by technology (network, network, network!). It was truly a memorable night and an opportunity for each woman in the room (and a few very brave men) to speak uninhibitedly about the impact of gender on leadership. More importantly, we realized that no matter what our role, pay, or job, we all encounter similar waves as we navigate our careers. Some become barriers. Others propel us to our next opportunity. A heartfelt thank you to all of our panelists! You are all incredible role models for women in business and we thank you for your willingness to share your wisdom and insight with the Peirce community. And for you, if you missed it, check out the slideshow of photos. Please read on for some of the questions posed by our audience and some of the answers and guidance offered by this strong group of Women in Leadership! How did you break into your field? What kind of advice do you have for women looking to break into a new career? For these women, it was all about going after their dreams and learning from people they admired. Another important message from them? Never stop learning. Vaneeda McDonald-Clyburn (Associate Business Partner, Organizational Development, Philadelphia Gas Works and Peirce graduate) said that finding out what you don’t like can play an important role in helping you discover what you do like. What is the biggest challenge you’ve faced as a woman in the workplace, and how did you handle it? The business world is full of powerful personalities and these are not gender specific. However, statistics show more men are in leadership roles in business and industry. Some of the biggest challenges for women tend to be finding a voice, earning respect, and being taken seriously, whether you are struggling against age, gender, race, or any other obstacle that presents itself. Women are responsible for so much more than themselves, how do you balance it all? The panelists agreed -- prioritize, learn to say no, set boundaries, try to find time for yourself, and develop a support system (and be sure to use it). Danielle Floyd and Martha Davis readily admitted that they don’t think they’ve ever found a true balance, but assured the audience that they are not alone if they feel that way! As long as you love what you do, don’t be afraid to throw yourself into it. It is OK to feel like you aren’t getting it right. Make mistakes, and take it one step at a time in figuring out the right balance for you. Do you feel successful? Do you think you’re at your peak? Success is different for everyone, but these leaders all agreed they feel most successful when they are making a difference, impacting people, garnering respect and admiration from their peers, and maintaining their integrity. And it turns out that our panelists were a very humble group. Many of our panelists admitted that they never really thought of themselves as incredibly successful, until they took a step back to take stock of their accomplishments. They encouraged all women to do the same and to acknowledge all they have achieved. Give yourself credit for your hard work and accomplishments, and then position yourself to move forward. This was their advice. And as I carve out my own career and leadership path, I can tell you it is sound, relevant, and time tested. Oh, one last thing! Martha Davis suggested some excellent books on leadership and we wanted to share those titles with you: "Six Degrees of Connection: How to Unlock Your Leadership Potential" by Liz Dow (President of Leadership Philadelphia, an organization which several of the panelists are a part of), and "The Soul of Leadership: Unlocking Your Potential for Greatness" by Deepak Chopra. The CDS center will soon have these books on hand for students and alumni to read!